There is no school April 15 - 22, 2019 for Spring Break and a Staff Development Day. Join us for Open House on April 30, 2019 at 6 PM. This is an opportunity for you to see all of the amazing work your child has done this year. We will start with a short PTA meeting in the multi-purpose room. 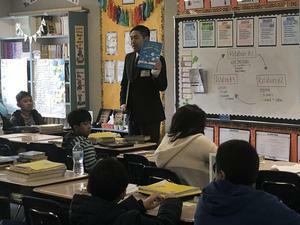 Thank you Board Member Xavier Nguyen for reading to our classes!